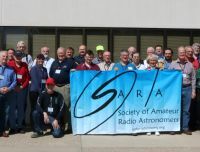 The Society of Amateur Radio Astronomers (SARA) hereby solicits papers for presentation at its 2013 Western Regional Conference, to be held February 9 through February 10, 2013, at Best Western Socorro Hotel & Suites at Socorro, New Mexico. Papers on radio astronomy hardware, software, education, research strategies, observations and philosophy are welcome. The 2013 SARA Western Regional Conference will be held at Best Western Socorro Hotel & Suites in New Mexico on Saturday and Sunday, February 9 and 10, 2013. We will have a tour of the Very Large Array (VLA) site west of Socorro. In addition to presentations by SARA members, we plan to have speakers from the National Radio Astronomy Observatory Array Operations Center (NRAO AOC) in Socorro. Additional details will be published online and in the SARA journal as we get closer to the conference date. Register now to avoid the rush and to guarantee a seat at the conference. This page is for posting the potential GRB detection data that I collect, as well as any data posted by other SARA members. I hope I can thus get folks to participate. There was a GRB on November 12, coming from the direction of Perseus. Here are an image of the data and a detail. I seriously doubt that what looks like a GRB in this data, for this time, is the real thing, but it might get folks to looking, and sharing data.